Yesterday, Electronic Arts mentioned just three console and/or PC releases coming up between October and the end of the year, and NBA Live 13 was not on the list. Given the series' troubled history, an E3 reveal widely judged to be a flop, and near silence from EA Sports since then, sports gamers took this as a sign the franchise was in some kind of trouble. Reached by Kotaku, an EA Sports representative for NBA Live said the game still has "a very aggressive launch plan, and the team is focused on bringing NBA Live back in a big way. "The development team at our Tiburon studio is working hard to get the game to beta," the statement added, "and we'll have a hands-on experience later this summer." 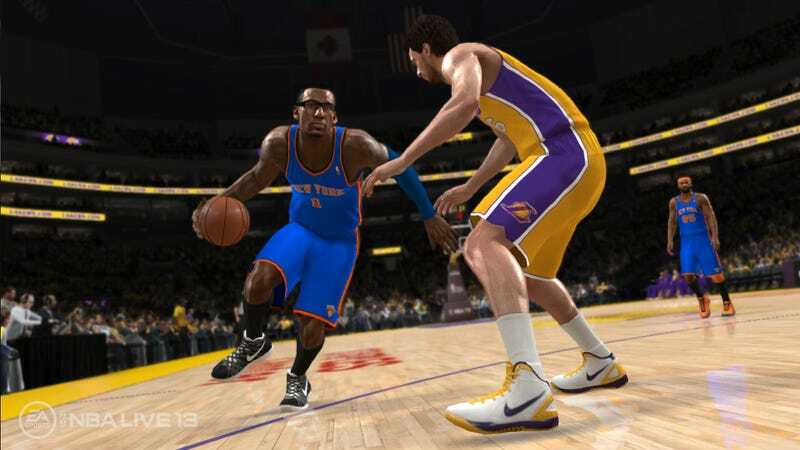 NBA Live 13 should release Oct. 2, the same day as NBA 2K13. Sports simulations, including directly competing titles, generally release on a date fixed by the league that licenses them. No official release date has been given for NBA Live 13 though. This edition should end EA Sports' three-year absence in the NBA simulation market, a hiatus brought on by a glitch-filled NBA Elite 11's cancellation one week before it was due to release in 2010.